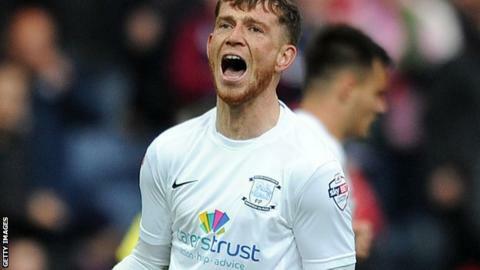 Joe Garner hit a hat-trick to preserve Preston's unbeaten home record. Victory sees Preston go second, five points behind leaders Bristol City but with two games in hand. Fleetwood remain in 11th. Match ends, Preston North End 3, Fleetwood Town 2. Second Half ends, Preston North End 3, Fleetwood Town 2. Attempt missed. Stephen Crainey (Fleetwood Town) left footed shot from outside the box misses to the right. Foul by Stephen Dobbie (Fleetwood Town). Attempt blocked. Callum Robinson (Preston North End) right footed shot from the left side of the box is blocked. Substitution, Fleetwood Town. Stephen Dobbie replaces Gareth Evans. Nathan Pond (Fleetwood Town) is shown the yellow card. Goal! Preston North End 3, Fleetwood Town 2. Joe Garner (Preston North End) left footed shot from the centre of the box to the bottom left corner. Assisted by Kevin Davies. Chris Humphrey (Preston North End) wins a free kick on the left wing. Steven Schumacher (Fleetwood Town) wins a free kick in the defensive half. Attempt missed. John Welsh (Preston North End) right footed shot from outside the box is high and wide to the right. Substitution, Fleetwood Town. Liam McAlinden replaces Antoni Sarcevic. Substitution, Fleetwood Town. Matty Blair replaces Josh Morris. Corner, Preston North End. Conceded by Conor McLaughlin. Attempt missed. Jamie Proctor (Fleetwood Town) right footed shot from outside the box is close, but misses to the left. Corner, Preston North End. Conceded by Jeff Hughes. Jamie Proctor (Fleetwood Town) is shown the yellow card. Foul by Stephen Crainey (Fleetwood Town). Goal! Preston North End 2, Fleetwood Town 2. Joe Garner (Preston North End) header from the centre of the box to the bottom right corner. Assisted by John Welsh with a cross. Corner, Preston North End. Conceded by Stephen Crainey. Goal! Preston North End 1, Fleetwood Town 2. Joe Garner (Preston North End) header from the right side of the six yard box to the bottom left corner. Assisted by Neil Kilkenny. Corner, Preston North End. Conceded by Nathan Pond. Attempt blocked. Paul Huntington (Preston North End) header from the centre of the box is blocked. Substitution, Preston North End. Chris Humphrey replaces Scott Laird.